Our firm specializes in offering an excellent range of Audio Connectors. To maintain industry defined quality standards, the entire collection is manufactured using quality assured raw material and latest technology at vendors' end. Also, the offered collection is strictly examined by quality experts upon different parameters of quality to ensure its flawlessness. 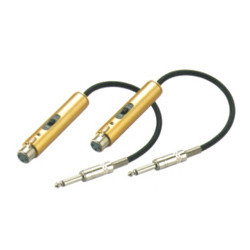 In compliance with set industry standards, we provide this connector in different specifications as per our clients’ requirements. Furthermore clients can avail this connector from us at reasonable prices. Incorporated in the year 2003, in Indore (Madhya Pradesh, India), we “Cable Plaza” are recognized as the foremost trader and supplier a wide range of Electronic Wires And Cables, Crimping Tools Strippers And Cutters, Cable Ties And Fittings, Terminal Block And PCB Connectors, PVC Channels, Cable Marking PVC Ferrules, Industrial Plug And Sockets, Audio Connectors, Flexible Pipes And Cable Glands, Cooling And Exhaust Fans, Indicating Light And Rotary Beacons, Copper And Aluminium Lugs, End Sleeves Ferrules, etc. Our complete product array is applauded for their sturdy construction, longer functional life, ease of operation and minimal maintenance. We procure these products from some of the reliable and licensed vendors of the market. The offered products are manufactured using modern technology and superior quality raw material. Known for their easy installation, durability and lightweight, these products are highly appreciated in the market. We have been able to furnish the diversified requirements of our respected clients in the most effective manner with the support of our experts.